One of the reasons its been quiet around these parts over the past week or so is that I spent the last 4 days in Chicago at the American Library Association’s annual conference. Imagine 20,000 librarians plus 5,000 library vendors and you begin to get the scope of the size of this conference. 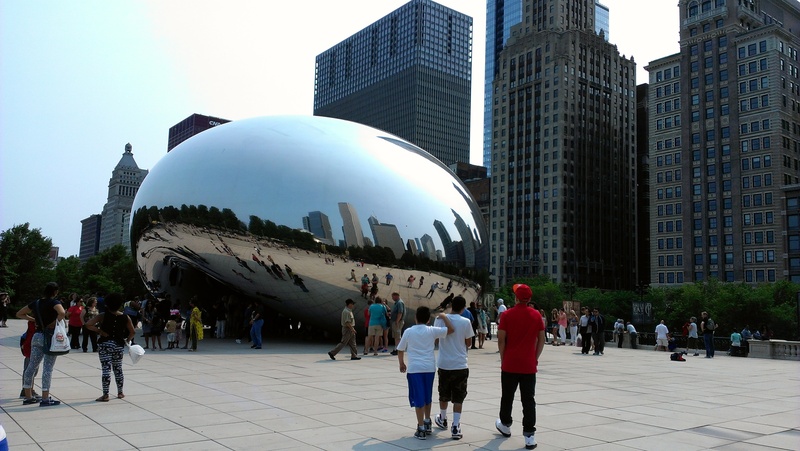 There are only a few cities that are large enough to handle the conference and (un)fortunately Chicago is one of them. The main problem with Chicago is that its convention center is in the middle of nowhere in regards to the city. Unless you are staying at the hotel attached to the convention center you can’t walk there. ALA always has shuttle buses from the conference hotels to the convention center no matter what city the conference is in, but this is the first time I’ve really had to use them. Most cities I’ve just relied on my own two feet and found it a much better experience. It gets me exercise during long days of sitting in meetings and with no waiting around for shuttles it’s generally faster. Plus, I know how much time to budget to walk a certain distance. Also the lack of anything around the convention center means that you don’t have time to run out and grab meals between meetings and thus are stuck eating the crappy, expensive food that you have to stand in lines a million miles long for. 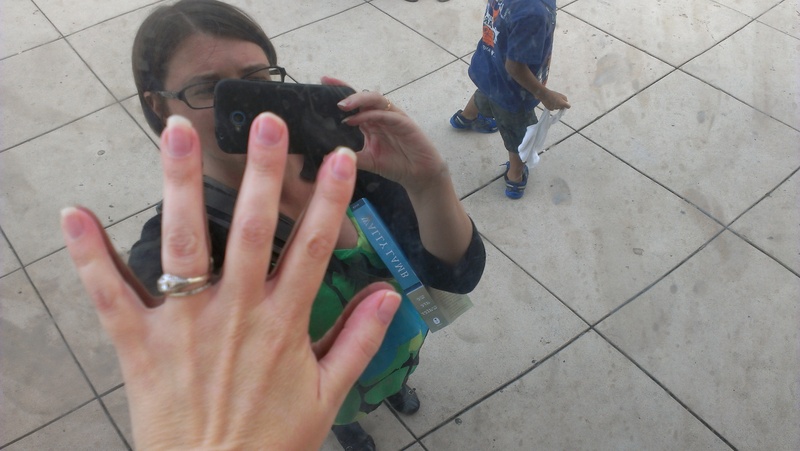 But enough griping about Chicago’s convention center because the rest of my trip was good. I’ve been involved with some ALA committees and thus much of my time at the conference is spent in committee meetings rather than getting to go to programming. I won’t bore anyone with all the details of my meetings or the few programs I got to attend because I doubt 95% of my readers would be interested as this is not a professional library blog. I will just say that the committee I just became past-chair of had some excellent meetings and I’m excited about where things are heading. I’m now happy to have the vaunted title of past-chair though as it means having all the glory with none of work. As you may have already guessed I didn’t get much time to get out and do things in Chicago as I mostly doing conference stuff all day every day. I know some people play hooky from conferences especially when they are in fun cities, but I tend to be a good girl. Plus when you’re there for meetings and not just to go to programs it’s a lot harder to do that. My main fun came with various dinners. On Friday night I finally got to meet in person someone I’ve been Twitter pals with for a couple of years. She is a fellow Wake Forest undergrad alum and also a fellow alum of the University of Maryland’s iSchool where she just finished her MLS. We met up at Frontera Grill, which is one of Rick Bayliss’ restaurants, for those of you in the know about celebrity chefs. I had just heard amazing things about it, and wanted to give it a try. I had been warned the wait would be long so we were prepared. It took us just a little over an hour to get a table, but luckily we wound up with bar seats probably within 5 minutes of getting there where we enjoyed some chips, guacamole, and drinks while we waited. The long wait also gave us more a chance to chat, so it wasn’t bad. We split the tacos al carbon 3 ways platter. Happily the waiter informed me that it was insane amount of food when I ordered so that we could make the decision to share instead of needlessly ordering ridiculous amounts of food. Everything was delicious, and it was great to finally hang out with an internet friend in person. Saturday night, instead of meeting up with a new friend I met up with an old friend who I used to work with at Barnes & Noble many years ago. She moved to Chicago 6(?) years ago and I hadn’t seen her since the last time I was in Chicago 4.5 years ago. I wanted to get some Chicago style deep dish pizza while I was there. We tried going to Giordano’s but the one near where I was staying was insane when we got there so we walked a few blocks to Pizzeria Due, which is the second location of the original Pizzeria Uno before it became a national chain. It was pretty busy there as well, but we decided to at least put in our name and see what the wait was. That was entirely ridiculous process. I have no idea who is running that restaurant, but unlike most places they didn’t seem to actually just want to write down people’s names and get them out of a line that was blocking the entire restaurant. We waited probably close to 20 minutes to give our name, but when we got to the front and said we only had 2 people in our party they seated us right away. Our waitress was pretty pitiful. She was nice, but she really didn’t seem to know what was going on and was very slow with everything. It took her forever to come to our table to start with and then I’m pretty sure she forgot to put in our pizza order. No matter, the pizza was good and like with Friday the extra wait time gave us more of a chance to talk and catch up in person rather than over Facebook. As is tradition, on Sunday night I went to dinner with some of my colleagues from one of my committees after our final meeting of the day. We ate a tapas restaurant called Nia. We did a shared 8 course menu, so not all the selections would have been my first choice, but everything was delicious anyway. I was especially fond of the bacon wrapped dates. 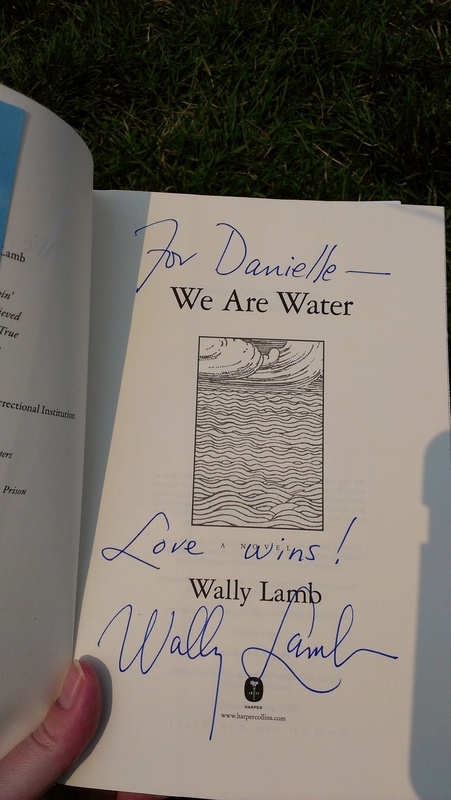 I had more meetings on Monday, but took a brief break in between my morning and afternoon meetings to stand in line and get a signed copy of Wally Lamb’s forthcoming book We Are Water. Hundreds of authors come to ALA and do signings and you can also get a ton of free book galleys even if the author isn’t there to sign them. I try to limit myself these days I already have piles of unread books from previous conferences. I try and make a list of the ones I absolutely want and stick to those. Of course whether or not you get any particular books sometimes means being at the right place at the right time as librarians are a bit rabid when it comes to getting free books as you might imagine. 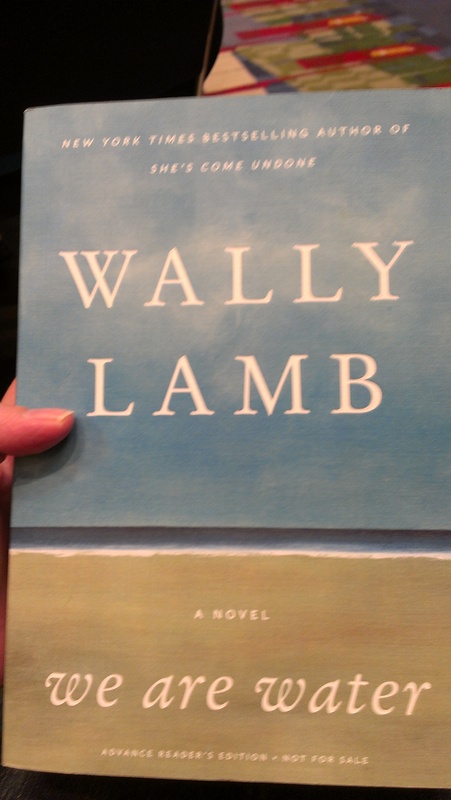 Off my list this conference I got the new books by Bill Bryson, Andre Dubus III, and of course Wally Lamb. He was about 10 minutes late for his signing for some reason so I got to stand there and watch the Harper Collins people freak out because he was missing and they couldn’t get a hold of him. Monday after my meetings were done around 3, I did have a few hours to kill before heading to the airport for my flight. 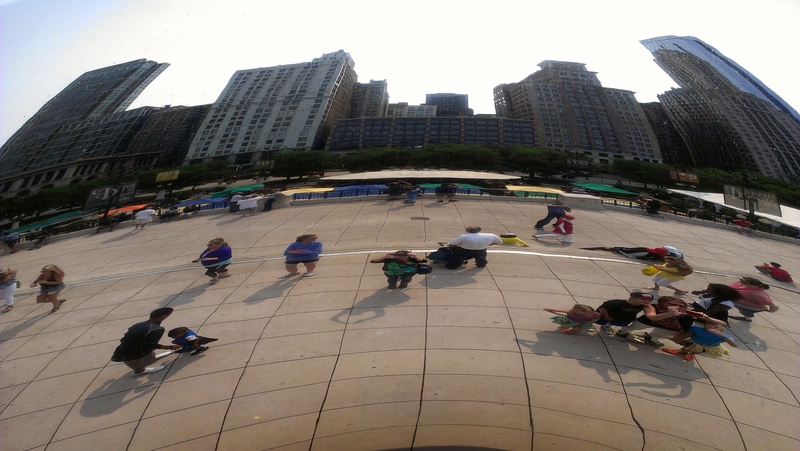 It didn’t feel like I had enough time to do anything super formal, so I just wound up wandering around Millennium Park. 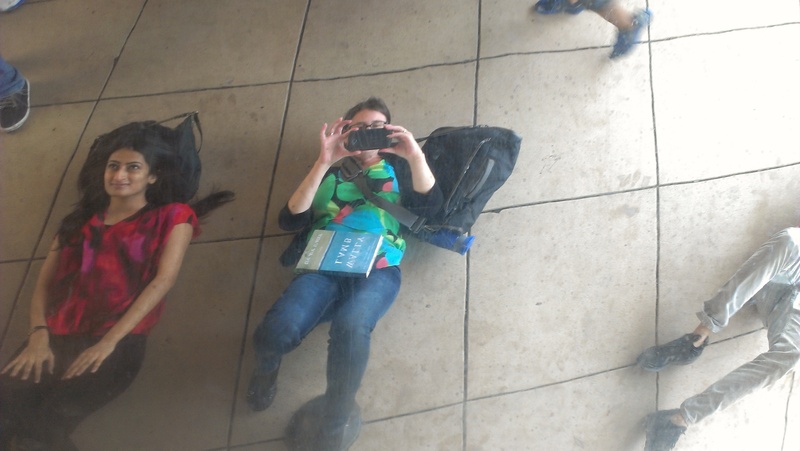 I had never seen the Bean before, so I decided to check it out. 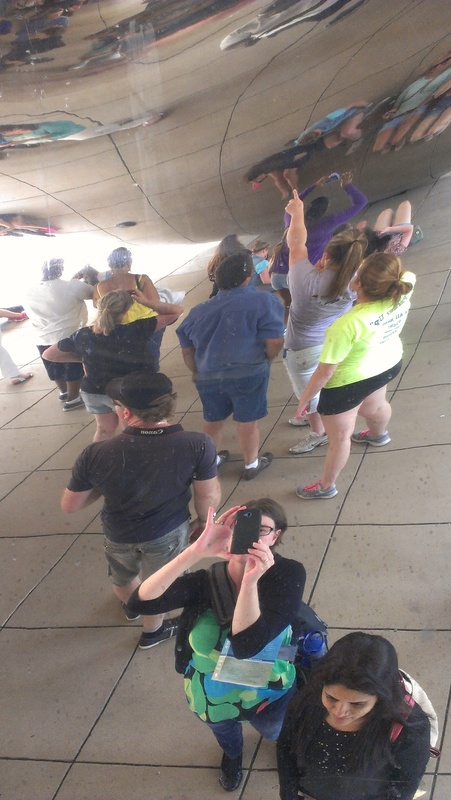 It’s hard to get good shots of yourself with the Bean when you are the one taking the pictures. 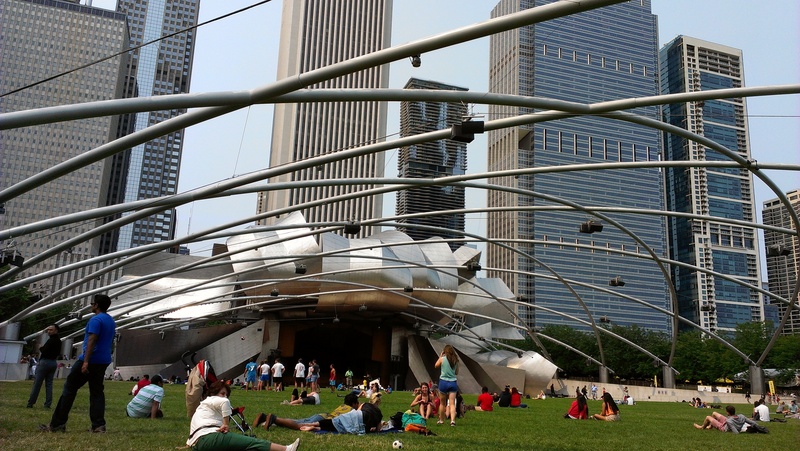 After I messed around with the Bean I wandered over and sat in the grass in front of the pavilion there. It was serendipitous because they have free concerts during the summer and there was one that evening. Though I was there much to early for the concert itself, the band was doing a sound check while I was there so I got to sit out in the park, enjoy some beautiful summer weather, and people watch while listening to some live music. There’s pretty much nothing better about summer. It was a good trip, conference, and time well spent with friends. i was beginning to think this was a restaurant blog, but you did finally get to the books.